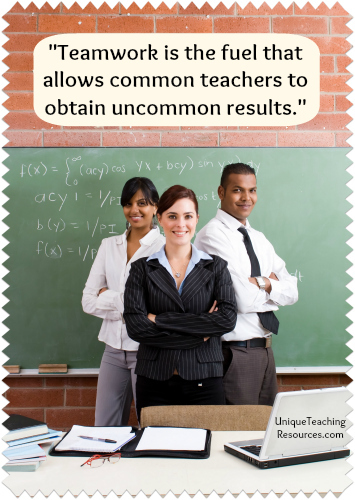 100+ Famous Teacher Quotes: Download free posters and graphics of inspiring quotes about teachers. 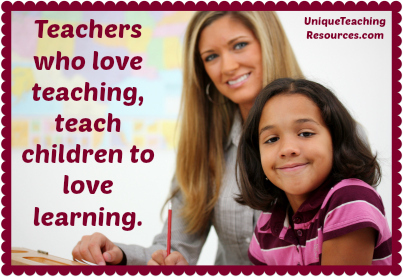 Note: This is Page 2 of my Quotes About Teachers. If you haven't visited Page 1 yet, please click on the underlined link above. 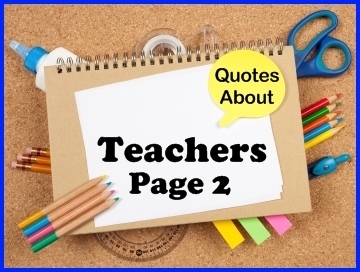 This page contains a large list of famous quotes about teachers that are ideal to use for educational publications, social media, and quotes of the day. 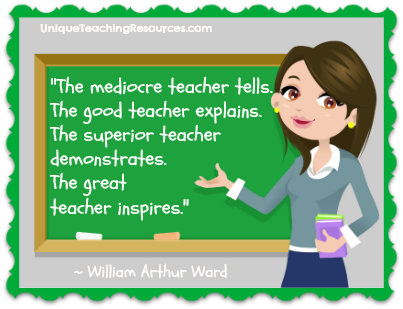 For many of the teacher quotes below, I have designed a one page poster that you can download for free. 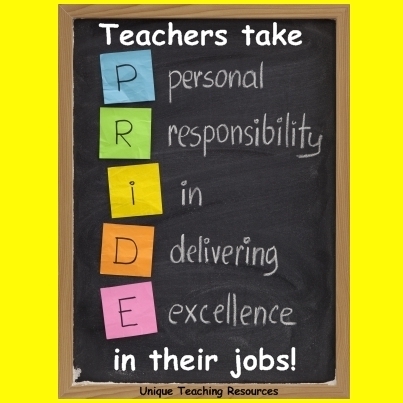 Print these free posters and display them in your staff room to uplift and bring a smile to the faces of the teachers that you work with. I have designed 17 graphics and posters for these quotes. 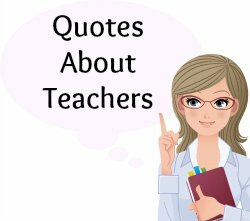 For your convenience, my list of teacher quotes is in alphabetical order. 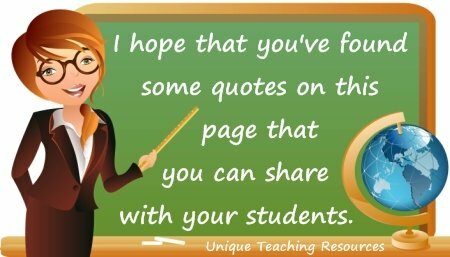 For some of the teacher quotes listed on these 2 pages, I have designed a one page poster that you can download for free. 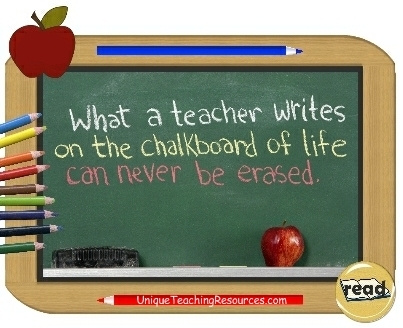 You can print these free posters and display them on a chalkboard, whiteboard, or a bulletin board in your classroom. 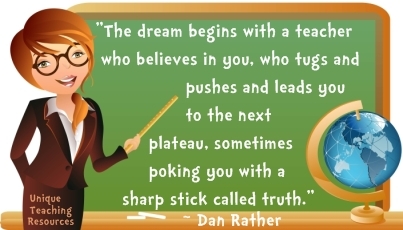 You may also want to display these inspiring quotes in the staff room at your school. 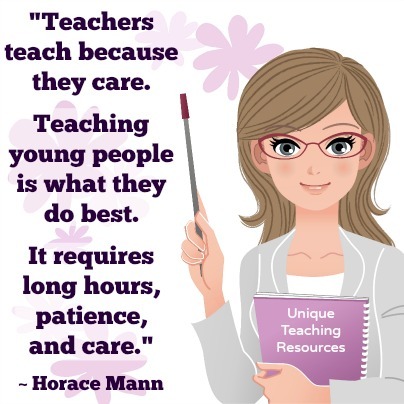 I will be designing more graphics for these quotes about teachers during the school year and adding them to this page, so please check back here from time to time. "Life's most persistent and urgent question is: What are you doing for others?" ~ Martin Luther King Jr. 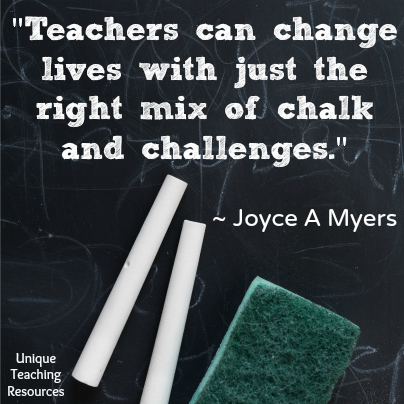 Teacher Quotes: Download a free graphic and poster for this quote below. 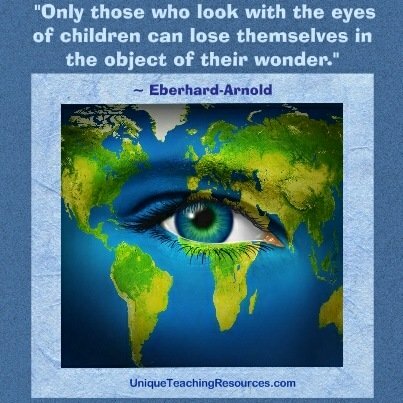 the object of their wonder." 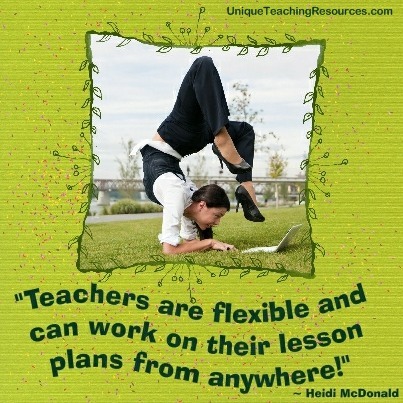 JPG: "Teachers are flexible and can work on their lesson plans from anywhere!" 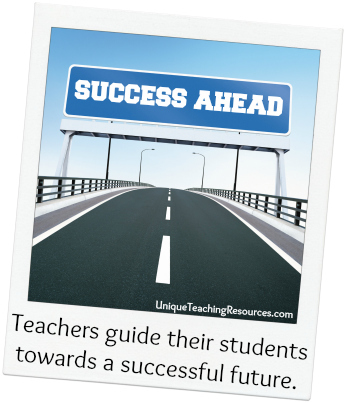 PDF: "Teachers are flexible and can work on their lesson plans from anywhere!" 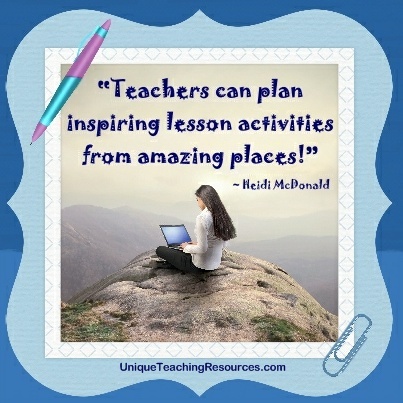 lesson activities from amazing places!" 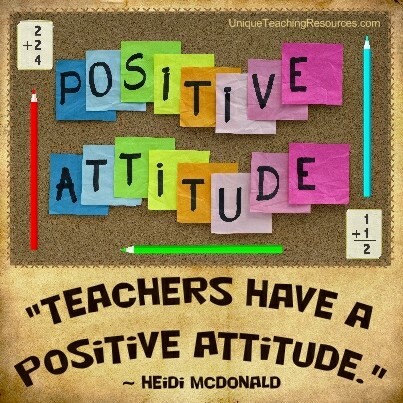 "Teachers take P.R.I.D.E. in their jobs! 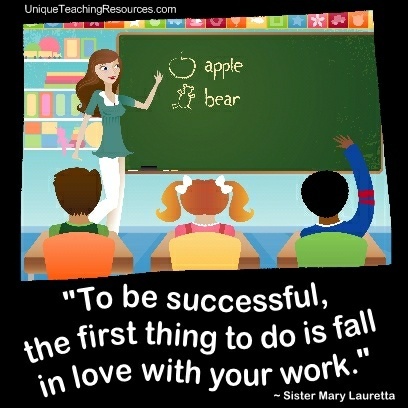 JPG: "To be successful, the first thing to do is fall in love with your work." PDF: "To be successful, the first thing to do is fall in love with your work." 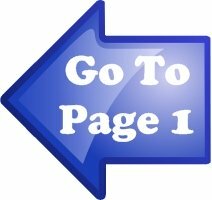 If you haven't visited Page 1 yet, please click on the underlined link below. 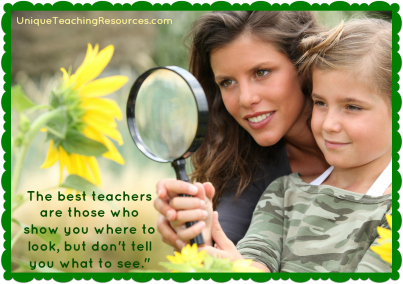 Are you looking for some fun book report project ideas? 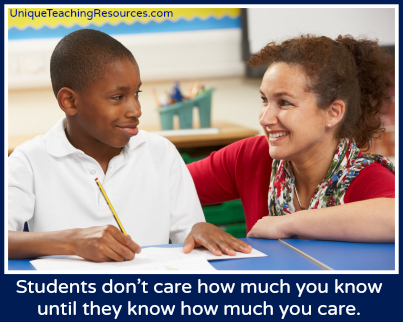 that will help you to engage your students in reading this year. 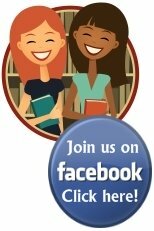 If you are interested in seeing educational quotes each day, I would suggest joining Unique Teaching Resources' Facebook group. 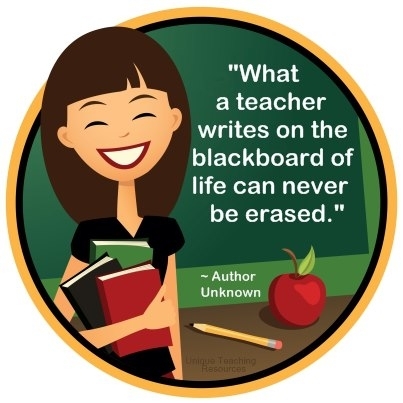 Every day on our Facebook page, I post inspiring and funny quotes for teachers, as well as links to other educational websites, videos, and current events related to the teaching profession. 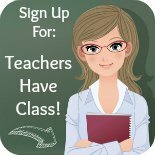 Facebook group of teachers from around the world. 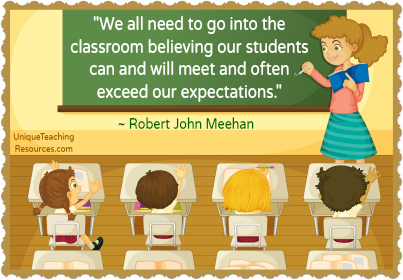 For many of my favorite learning quotes that are found on this page, I have taken the time to design a graphic and/or a one page poster using the quote that you can download for free. 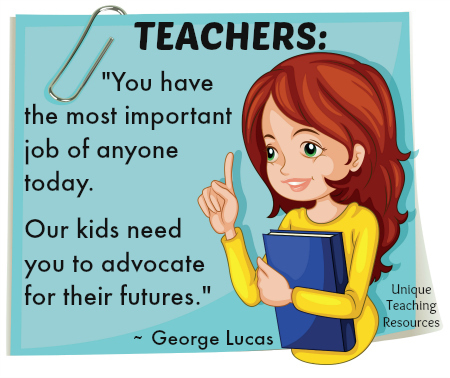 If you are using the graphics that I have designed for these teacher quotes on your website, teaching blog, Pinterest, Facebook, Twitter, newsletters, or any other publication or educational matter, I would appreciate it very much if you would follow proper copyright laws. 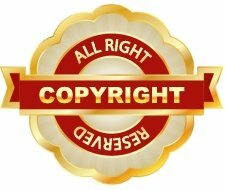 Please respect intellectual property rights and use professional teacher etiquette by providing a reference and including a link back to this page on Unique Teaching Resources where you found the graphic that I designed. 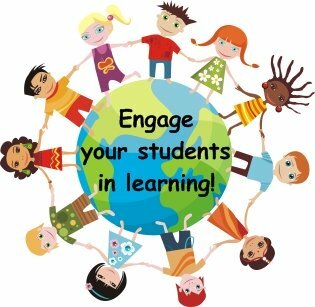 Thank you for your professional courtesy and for helping to me to spread the word about my website by providing a link back to Unique Teaching Resources. as well as many quotes by famous people? Click on one of the links below to take you to a specific category of quotes. 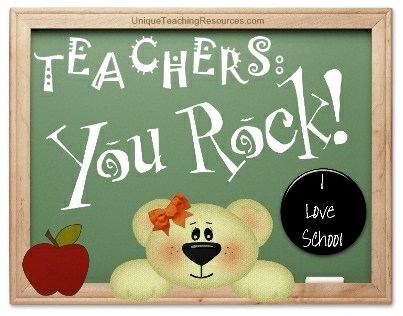 Thank you for visiting my Teacher Quotes page.